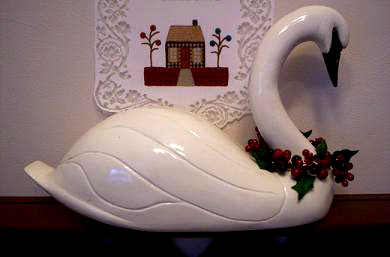 Poinsettia Leaf Swan is one of the Holiday Swans Collection. Here in our mitten state, swans have proven to be a popular and much loved accessory. They can be decorative, beautiful, heirloom pieces placed on hearths, fireplace mantels, porches and gardens. Adorned with simple 5"candle ring that comes in plastic or silk. These are relatively easy to find in any craft or flower shop. Can be changed easily and quickly by removing ring over neck and head, and replacing with similar 5" circular arrangement. Swan is hand carved and painted, sealed with polyurethane for a glossy and satin finish.